Avanza, a Spanish word for “get ahead” is an annual paper presentation contest, which AISAT has been conducting since its inception. This year, Electrical & Electronics Engineering and Electronics & Communication Engineering departments in AISAT are conducting Avanza Junior, giving an opportunity for school students to get acquainted with different technologies that has revolutionized social life. Contestants present posters about the Technology that has impressed them and participate in a technological quiz. Two students from higher secondary (Plus one or Plus two) guided by physics teacher can register for the contest. 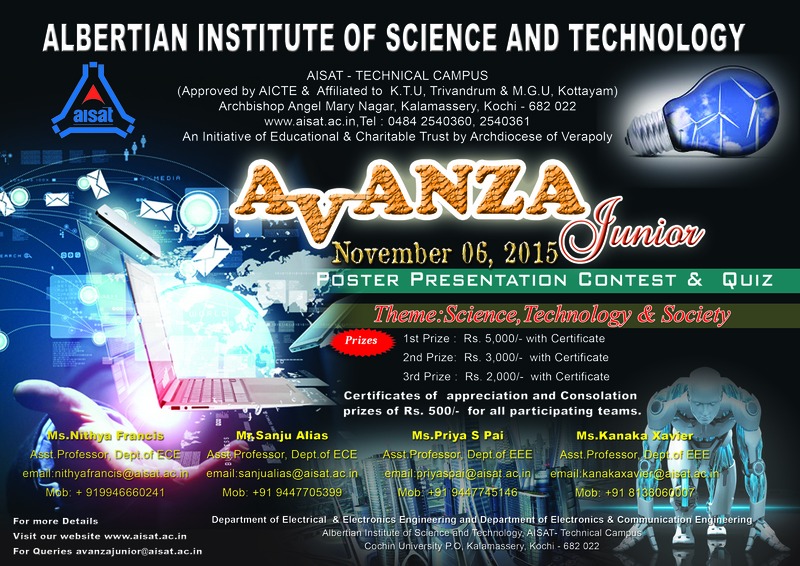 Each team should mail the abstract of the poster theme and duly filled entry form to avanzajunior@aisat.ac.in on or before 1st October 2015. Abstract should be of 200 to 250 words. The format for abstract and entry form are available in the website. Selected teams will be informed via E-mail on or before 16th October 2015. Selected teams accompanied by physics teacher should report in the college at 9 am on 6th November 2015. Teams can bring their designed poster in A1size paper. Printed posters are not permitted. The theme of the paper can be conveyed with aids like drawings, paper cuttings and short write-ups. Posters can be supported with still or working models or both. 10 minutes will be given for the oral presentation of the poster. An objective test will be conducted on the theme. 1st Prize: Rs. 5,000/- with certificate . 2nd Prize: Rs. 3,000/- with certificate. Consolation Prizes of Rs. 500/- and certificates of appreciation for all those who present papers.